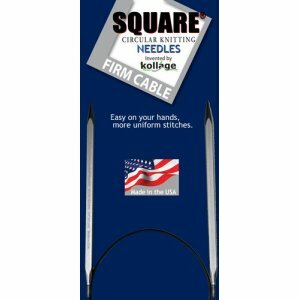 The Kollage square needles are made of a lovely high grade aluminum in a titanium color and have precision point tips. The square shape is easier on your hands and also can make your stitches straighter and more uniform. The cable is firm in comparison with the k-cable, however it is still a malleable cord that is ready to knit with straight out of the package! These needles are quite unique and would certainly be a wonderful addition to any knitter's tool kit! You can also view all Kollage Square Circular Needles (Firm Cable) Needles.